No Such Thing as Immortality opens with Nathaniel (Nate) and friend James racing each other along country lanes. Their early morning fun halts suddenly when Nate shunts into the back of Rowan. At first Nate isn’t sure what’s happening but when he realises he’s feeling Rowan’s emotions, he is totally panicked (as is James). Not only does he feel her emotions but when Nate is able to meet her eyes, there is also a connection on a deeper level. From this moment, Nate is connected through Rowan’s emotions. Whatever she feels, he does too. Alongside this is Nate wanting to protect her and this leads to some humorous moments … the shower scene had me laughing. In the hospital, Nate meets Rowan’s family and this is the first hint of intrigue surrounding Aunt Hetty. We’re introduced to Nate’s ‘housemates’ (all vampires) who work as a team to deal with and protect Nate from the debilitating effect of the connection with Rowan. I enjoyed the way they connected and worked together. As Nate and Rowan’s relationship develops, Rowan’s ancestry is researched by housemate Madeline. This ultimately leads to more intrigue. The emotions for Nate are all-consuming … having never engaged emotionally (even as the Regency gentleman he was in his human incarnation) they are all powerful and controlling. The romance between Rowan and Nate is beautiful and poignant. I have to be honest and say however that my interest in the series is not so much the romance but the magical layer beneath the surface! Besides the romance we have conflict with Simeon Frey. Not your run-of-the mill rival, the conflict leads to an amazing magical scene. This has to be my most favourite part of the story! and is the hook for me to read the next book in the ‘No Such Thing’ series. I really want to see where this takes us. Some parts of the story I found slow and I would love to have read Rowan’s perceptions of all that was happening (unusually for Choc Lit publications, this is written in a first person narrative from Nate’s perspective throughout). Rowan is a fabulous character and I think this would have added depth for me. Nate annoyed and irritated me at times, especially in the beginning and after the major conflict. I could understand why he reacted the way he did but I still wanted to shake him! 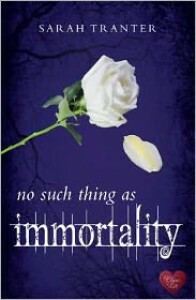 No Such Thing as Immortality is a story of a two centuries old vampire who finds his soul-mate as a result of an accident (accident? Co-incidence? Fated? Ah yes, the intrigue) and learns to come out of his self-imposed isolation. You would be able to read this as a stand-alone romantic story but this is only the surface. I think the plot is much deeper … Why did they meet this way at Beltane? What major battle is their love going to be a part of? Why are the two families being connected in this way? Are there going to be more vampire deaths? If so, why? Whose immortal life will be lost next? What secrets will be uncovered? I have my own theory and I can’t wait to find out if I’m right! I bought the Kindle format.